A malfunctioning light commercial air conditioning system can disrupt your profits, but the fast and reliable repair service from LIBERTYAIR can cool off your employees and keep your customers comfortable. Businesses in Florida need high-functioning air conditioners to combat the heat and humidity outside and prevent rising temperatures inside every time the door opens. If you notice that your light commercial air conditioning system is not blowing cool air, or is not blowing air at all, contact LIBERTYAIR right away. Keep your customers cool with LIBERTYAIR. At LIBERTYAIR, we keep our Gainesville businesses calm, cool and collected. There’s no need to fret when you have a broken air conditioner as long as you call our professional light commercial HVAC technicians. Around the country, temperatures are rising. Each summer seems to be hotter than the last, and many residents in Florida rely on public businesses to stay cool. During extreme heat waves, residents without proper air conditioning at home are often encouraged to visit malls, libraries, supermarkets and other local businesses to escape the excruciating heat. So when your air conditioner isn’t working, you can lose a lot of business. On top of dwindling profits for the day, your employees are likely to become tired, cranky and downright uncomfortable. Office buildings, retail stores and restaurants often do not have adequate ventilation when the HVAC system fails. Don’t put yourself and your workers at risk — contact LIBERTYAIR right away and our light commercial HVAC technicians will be on their way as soon as possible. Because the temperatures can rise so quickly in Florida, we understand the urgency needed when an air conditioner fails. Call our emergency repair line so we can diagnose and repair the issue quickly. Don’t take chances with your business or property on the line. Our technicians are licensed and certified in heating, ventilation and air conditioning, so you can trust that we will always deliver high-quality results. Light commercial HVAC systems often need repairs. 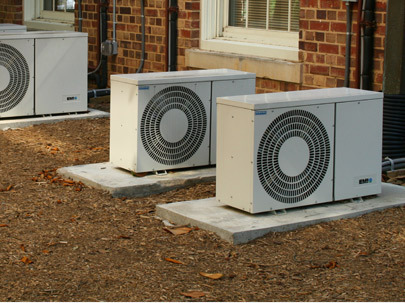 Commercial air conditioning units can run continuously to ensure a comfortable indoor temperature. While residential units have the ability to take advantage of energy saving practices, such as raising the temperature when no one is home, commercial HVAC systems may be kept at ideal temperatures day and night. In addition, air ducts and ventilation systems in commercial buildings are vast and extensive. This ductwork can cause stress on your air conditioner if it is obstructed by dirt, debris or foreign materials that should be placed in the ventilation system. In order to keep your business cool, we recommend scheduling regular maintenance for your light commercial HVAC system and ductwork. Basic maintenance can include changing the air filters, cleaning out the heating and cooling system, replacing worn out fans and other moving parts, as well as a thorough cleaning of the ductwork. Many business owners skimp on cleaning the ductwork because they may only use a portion of it. But when your air conditioner gives out on a hot and humid day in Gainesville, you’ll wish the breakdown could have been prevented. Let LIBERTYAIR and our skilled light commercial air conditioning technicians prevent future breakdowns and keep your business cool even on the hottest days.